Last year I collaborated with Talborne Organics and Grant Gove of GLC Design Studio to create a magical cottage garden for the Garden World Spring Festival. 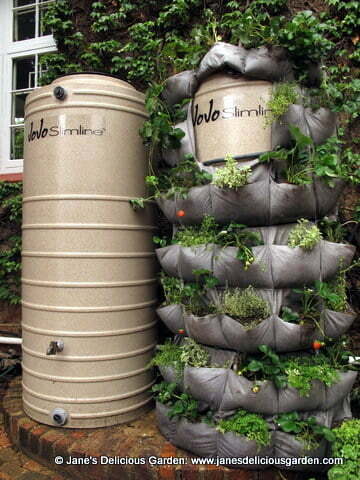 One of the ideas we came up with was to cover the JoJo water tank with a vertical garden and fill it with vegetables and herbs. I loved the result. 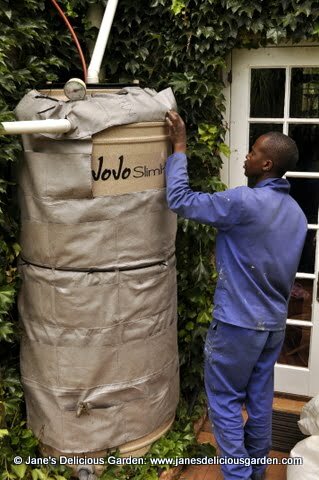 Many people want JoJo tanks but they don’t want to waste limited garden space to install one – this JoJo water tank wrap garden actually created more garden space. We have quite a few JoJos in our garden and, inspired by the Garden World tank, I decided to cover two of them with vertical gardens. 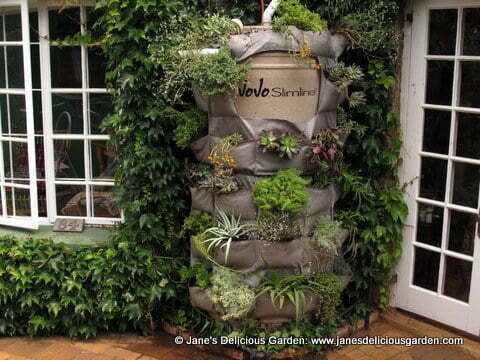 Our north-facing grey water tank is in a very hot position so I chose to cover that one with hardy succulents. I could have propagated this garden from existing succulents in my garden but I wanted far more variety. After a few Google searches and phone calls I was chatting to Malcolm from Kazimingi Farm out on the East Rand, who specializes in succulents. A week later, walking through his rows upon rows of succulent greenhouses, I realised this was an understatement – Malcolm is passionate about succulents. I had never seen such a collection of colours, shapes and varieties and left with a very full Kombi. The second JoJo I wanted to cover is in our driveway and gets morning sun until about midday – perfect for strawberries and herbs. On a visit to Garden World I had seen good sized strawberry plants and Luis kindly delivered them to me – along with a selection of herbs. Next I needed some help with creating the JoJo Wrap. 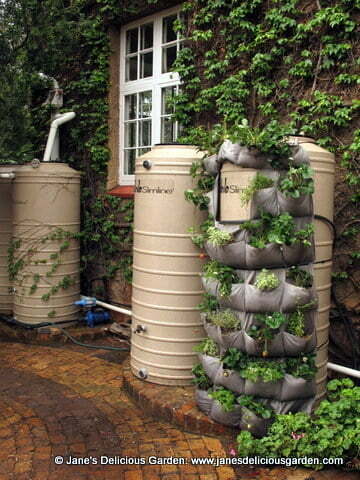 The person who had helped with the Garden World tank had unfortunately left South Africa – so again I turned to Google. And discovered Justin Sam of Vertical Landscapes. 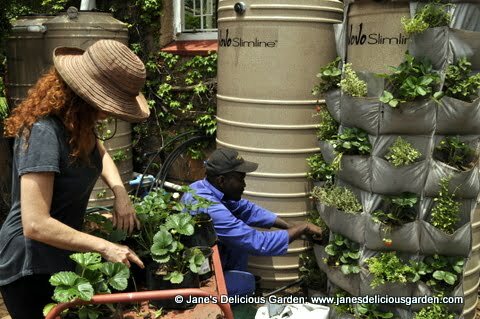 Reading some articles about him I discovered he was an ex-aeronautical engineer with a passion for greening urban spaces. 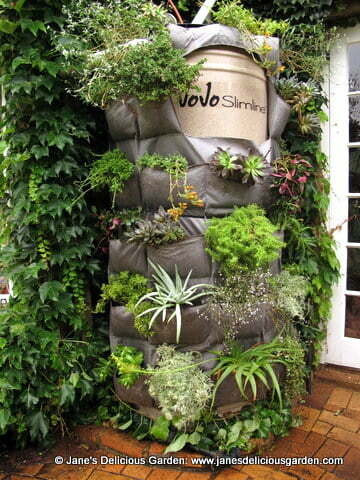 Perfect – if anybody could create a strong vertical garden it would be rocket scientist! The final ingredient needed was the growing medium and Talborne Organics created a perfect mixture, including Canadian peat, Fertilis, vermiculite and some calcitic lime to neutralize the peat’s acidity. Talborne’s Vita Grow completed the mix. 1. Justin made a planting bag out of strong landscape material based on the measurements I sent him. 2. This was positioned around the tank and holes were made to accommodate the piping and taps. 3. Small holes were cut along the top of the bag and stainless steel cable was threaded though them. 4. The cable was connected to form a circle and this was tightened around the top of the tank. 5. A second cable was positioned about midway down the tank to support its weight, as it was going to be quite heavy once fully planted. This was left a little slack so we could still fill the bags. 6. The planting pockets were half filled with growing medium. 7. The seedlings were transplanted, the pockets filled up and watered well. 8. The middle cable was then tightened fully. 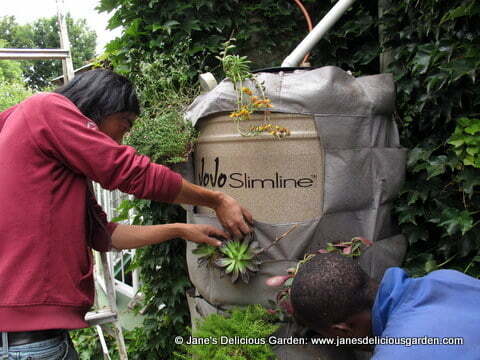 The final step was to install an irrigation system on the strawberry JoJo wrap. 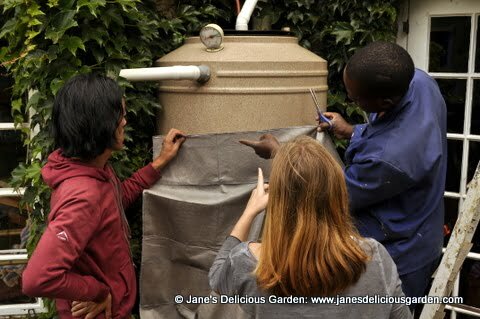 This tank is part of a series of rainwater harvesting tanks. They are connected to a pressure activated pump, and when I turn on the wall-tap, rainwater comes out. Justin and his team installed a drip irrigation system with each pocket having an individual dripper. This is attached to a timer on the tap that turns the pump on at the same time every day for about ten minutes. 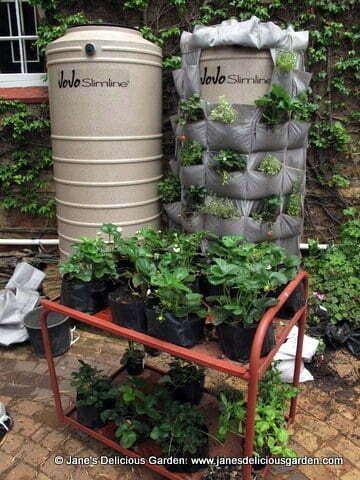 Now the vertical strawberry and herb garden is being watered by its own JoJo rainwater. The hardy succulents are happy without any irrigation. In the few months that they have been planted, we have already harvested dozens of strawberries. So far I haven’t seen any birds on them or any bird damage – but I did discover a couple of fat snails hiding behind the planting bags. Once I removed them I quickly placed a barrier of rolled pot scourers around the bottom to prevent the blighters climbing up again. 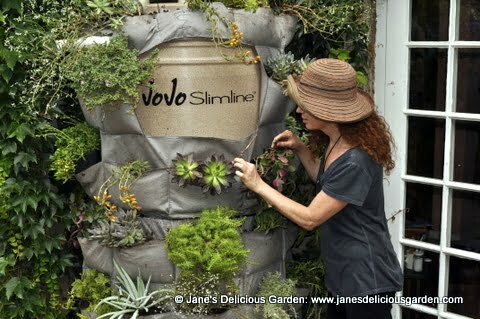 I am now eyeing my remaining JoJos and planning – what I am going to plant on the next vertical garden? Would you pay US$10 for ONE strawberry? The tank is dry and the vegies are dying. Do I buy water? Jane, what a fabulous idea. Just love it. Nothing like utilising every available spot. 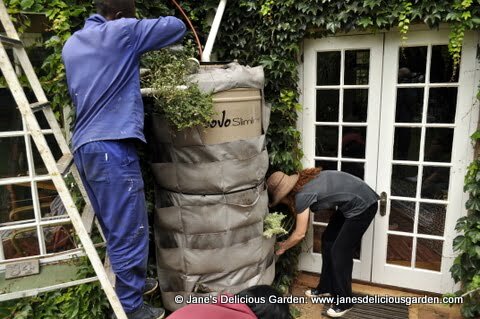 When we built our house 4 yrs ago we were obligated to have the 3000 litre rainwater tank buried in our front garden and we just planted on top of it, only leaving the access lid exposed. 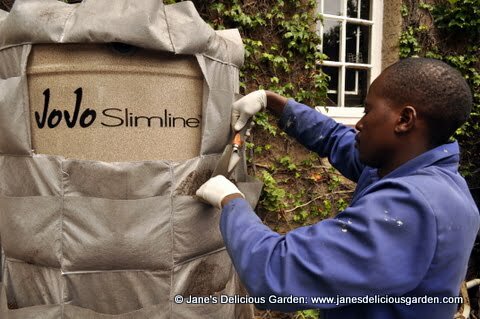 Great idea Jane, but I’d like more information and detail on how the planting bag was made, eg Was it stitched on a machine? Is there a pattern to making the pockets a little fuller to hold soil or growing material. “Strong landscape material” : is this weed matting? How is the stainless steel cable joined? The material is weed matting, which lasts for many years under pathways so it will be strong enough for this. The pattern was designed by Vertical Landscapes http://www.verticallandscapes.co.za and it was stitched together on an industrial sewing machine. The steel cable was joined using a cable clamp that can be tightened – any hardware store should supply them.